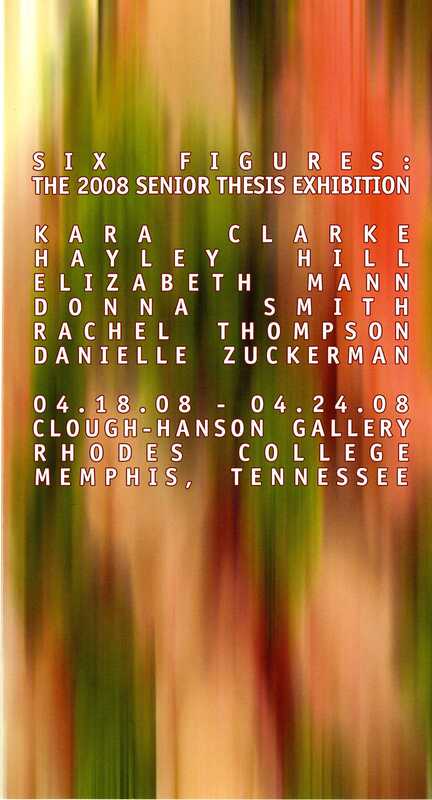 This is a digital copy of the exhibition brochure for Six Figures: The 2008 Senior Thesis Exhibition. This group show was featured in Clough-Hanson Gallery April 18 - 24, 2008. The exhibition included artwork from Kara Clarke, Hayley Hill, Elizabeth Mann, Donna Smith, Rachel Thompson, and Danielle Zuckerman. The brochure contains color images and artist statments from each student artist. “Six Figures: The 2008 Senior Thesis,” Rhodes College Archives and Special Collections, accessed April 18, 2019, http://archives.rhodes.edu/items/show/368.